The REMM Group was awarded Accredited Management Organization, AMO, of the Year for 2017 by the Institute of Real Estate Management, (IREM) Orange County Chapter. IREM OC promotes and develops excellence in Real Estate Management and Managers. We are proud to receive this award from them. IREM chapters around the world award AMO® of the Year to real estate management companies to acknowledge their excellence in Real Estate Management. Orange County’s winner for 2017 is The REMM Group. 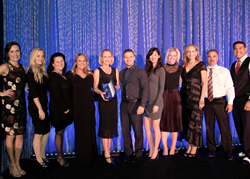 The Tustin based management company was honored October 26th at a Gala Event held by IREM OC. At the same event Windell Mollenido, Director of Marketing for The REMM Group, received the President’s Award. The REMM Group was identified as one of Orange County’s fastest growing small companies for the second year in a row according by The Orange County Business Journal. Recent high profile projects include Enclave Otay Ranch, a new luxury apartment community in San Diego County, and The Link, a mixed use property under construction in Glendale. AMO® of the Year winner must demonstrate that they have advanced the real estate management industry, providing superior service to clients, tenants, and residents. Additionally they must exhibit ethical and best industry business practices and support employee professional and leadership development. “Being recognized as the AMO Award winner is a prominent accomplishment for The REMM Group. This shows the company’s dedication to excellence, active community involvement and devoted participation to the Institute of Real Estate Management,” said Sara Maas, Executive Director of IREM Orange County. The REMM Group is an IREM Accredited Real Estate Management Organization (AMO). They provide property management for industrial, office, retail, mixed use and multifamily properties. Sara D’Elia was IREM OC President in 2013. The REMM Group’s corporate office is located at 15991 Red Hill Ave. Ste. 200 Tustin, CA 92780. IREM is an international community of real estate managers that is dedicated to ethical business practices, maximizing the value of investment real estate, and promoting superior management through education and information sharing.